This was just before our last jump across, in a calmer yet still pretty fast flowing section of the river. You can see our helper on the RHS, with the rope. The snake appeared just below where we’re standing – which is essentially also where we jumped from. It wasn’t raining, so the canyoning was on!! One of the brothers in the family we were in had been down to the river in the morning and said it was pretty high due to all of the rain from last night, but still doable… so we were off! 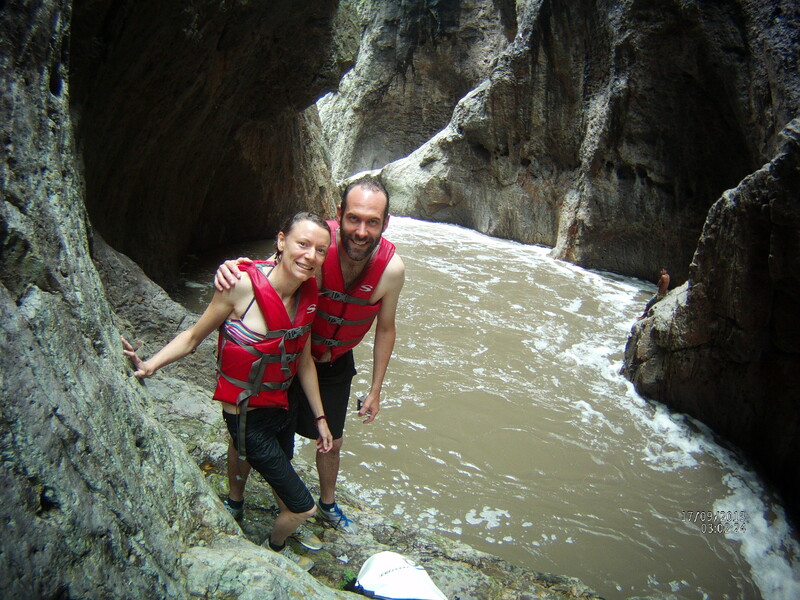 Armed with lifejackets, our little canyoning party comprised the two of us plus our guide, Olvin (another one of the brothers). There were others heading down to the river too, but each little group had its own guide. Our first challenge was to walk across the river which was flowing very, very fast and was about waist deep (for me). Even that was akin to some sort of resistance workout! From there, we hiked up to a lookout, back down to the river and into a boat where another local rowed us upstream to the start of the rapids. Apparently, in the dry season, the river is calm and absolutely translucent. I’ve seen photos, so I know it must be true. For us, however, the river was a foamy brown, powerful looking force to be reckoned with. I was not feeling excited about potentially jumping into a surging mass of brown water were I couldn’t see through the water to check whether there were any rocks or other submerged objects that might, you know, break my back. It was once we got out of the boat that the fun really began. Having decided that we looked like swimmers, Olvin began leading us to a small waterfall at the top of the river. At its easiest, this involved us clambering along rock ledges at the edge of the water. At its more challenging points, it involved us waiting for Olvin’s local assistant to swim across the river with a rope around his belly and throw one end of the rope back to Olvin. The assistant would brace himself against rocks on the other side of the river (and I mentioned it’s a canyon – so I’m talking sheer rockfaces here), Olvin would pass one of us the end of the rope and instruct us to jump into the rapids and pull ourselves across, hand over hand. In parts, the rapids were so strong it was a serious workout just hanging on to the rope, let alone dragging ourselves forward. We must have done this at least ten times, slowing zig zagging our way across the deep,fast flowing parts of the river to reach the waterfall. We had one jump to go, and Adrian was about to take off when Olvin’s assistant started whistling urgently at us from across the river. ‘Serpiente! Una serpiente’ he cried. Oh yes – about one meter below us, on the rocks, a snake had just slid out of the water and was heading our way. Olvin splashed water on it from a rockpool… and it slid back into the water. We could see it swimming downstream, it’s skinny head bobbing casually above the water. Then Olvin instructed Adrian to jump into the water and swim across. Yeah, right. But – not only did we do that, in the absence of any alternative option we also then floated/swum the approximately two kms downstream to get back to where we started. The whole time, I was keeping my eyes peeled for little stick like things bobbing out of the water. Sometimes, ignorance is bliss. This would definitely have been one of those times! After a quick lunch back at the house, we said goodbye to the family and continued across the country to Managua. Our destination was the house of another biker who blogs on Horizons and runs a motorbike tour and hire business in Nicaragua. He, Salvador, also – incredibly generously – has an open invitation for any motorbike travellers doing the Pan American highway to stay at his house. The house is just lovely… so homely, so peaceful and it was a huge relief to arrive here shortly after nightfall. We were later than we wanted to be (and broke the golden rule of no riding at night) due to the later than expected post canyon start. So I was incredibly happy to be warmly welcomed by Salvador’s mum! On the way here, we were stopped by the police for illegally overtaking a truck across a solid yellow line – and (we think) for speeding while overtaking. Not that there are any radars, it was just the police officer’s (correct) guess. However we pleaded ignorance, explained that we’d only just arrived in Nica and didn’t know the rules so followed the two cars in front of us (which had also been pulled over)… and they let us go with a warning. That put us a bit on notice, which was lucky – as we must have ridden past at least four other police pulling people over for the same thing. From then on, we generally only overtook the many slow buses and trucks when we had a dotted line. We also saw two pretty serious looking accidents, including one where a truck had flipped on its side and blocked almost the entire road.